Nordic skiing, also known as XC skiing or Cross Country skiing, is an exhilarating outdoor activity for all ages and fitness levels. A great sport to experience with friends and family, Nordic skiing in Central Oregon is fun, beautiful, and good for your health. 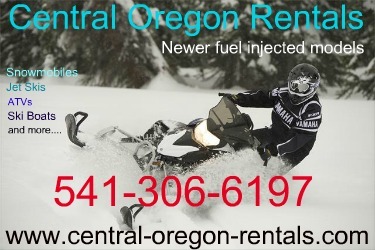 Whether you are in the High Desert for a day or a week… whether you have been cross-country skiing (XC skiing) for years or are new to the sport… whether you want luxurious accommodations or something more budget-friendly.... Central Oregon is the XC skiing vacation destination for you! There are more than 250 kilometers of cross country ski trails in Central Oregon. Most are less than one hour from Bend, Central Oregon's largest city. 19 different trails systems stretch thoughout the High Desert region providing many action packed options for your vacation . Trek the 56 kilometers of groomed and tracked trail around Mt Bachelor or ski Hoodoo area for beautiful vistas of Mt Washington and Three Fingered Jack. Enjoy this stimulating, affordable, and yet simple to learn sport. Cross country skiing is both easy, as well as accessible, and offers a great variety of experiences. XC skiing is not too complicated and does not require alot of gear – it is just good, healthy fun! XC skiing uses natural body movements. It does not require special skills to get started and has a very short learning curve. Just a few hours spent being coached by a local professional XC skiing instructor will give you the skills needed for a lifetime of fun! 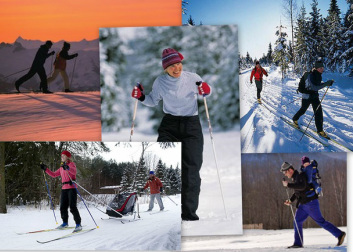 Cross country skiing is one of the healthiest recreational activities for both body and soul. You can enjoy the bounty of nature Central Oregon's wilderness has to offer, with its towering trees, mountain vistas, and snow covered meadows, while experiencing a total body workout. XC Skiing uses all of your muscle groups and is an outstanding cardiovascular activity! Plus, you can Nordic ski at your pace and according to your fitness level... from smooth gliding on mild trails to bounding up, over, and down diverse terrain. cross country skiing. Even the family dog can join the party! Some Sno-Parks welcome canines on designated dog trails. Special enclosed sleds, called pulks, can be rented at local ski supply vendors. 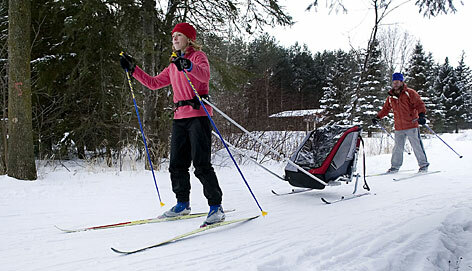 They are designed to be pulled by a cross country skiers and usually are equipped with a back support for a child. If you enjoy your outdoor Nordic experience and want to buy your own gear here are some basic recommendations for the Nordic Ski gear you will need. they go faster, glide farther, and are quieter sliding over the snow. like a walking shoe. The boot you choose will determine the binding system for your skis. Wearing seamless socks made of blended material is the recommended choice and a good local ski shop can aide you with that purchase. type of skiing (classic or skating)that you will be performing. It is best to consult with a professional for a proper fit at your local ski shop. For recreational skiers, waxing is not a complex process. There are simple wax systems that allow you to select from three waxes based on temperature. Wax is applied to the ski surface by hand or heated iron, and then buffed in. Racers, however, take waxing to a whole different level - for them, it becomes a science of creating just the right mix of waxes to make skis go faster. You decide how far you want to take the sport. Have fun, be safe, and enjoy all Central Oregon has to offer.